HERALD WAR REPORT: Advert from the Morpeth Herald, July 6, 1917. In connection with the National Service Scheme, so far as the Borough of Morpeth is concerned arrangements have now been made to have a thorough house-to-house canvass. The non-success of the scheme, locally, has been largely attributable to the fact that few people have taken an enthusiastic interest in it. It is not a popular scheme by any means, but another effort is going to be made to see if better results cannot be attained in the borough. A committee has been formed, and the Town Clerk, who has been appointed secretary, has furnished a workable scheme. If sufficient workers can be got to carry out the proposed scheme in its entirety, then the committee will be in a position to state exactly what labour is obtainable in the borough as volunteers for National Service by enrolment or for half or part time service, and in what industry and occupation. Everyone must realise that the present is the time for every man and every woman to respond and give whatever help that is possible in the way of national service. The result of the proxy voting on the resolutions at the recent annual meeting of the Northumberland Miners’ Association was announced on Tuesday. The principal subject was the question of peace-by-negotiation, which the lodges have rejected by 394 against 93 in favour. The proposal for higher wages to meet the increased costs of living was almost unanimously adopted, the figures being 481 for as opposed to 6 against. The organisers of the flag day in Morpeth on Saturday last have reason to feel gratified at the success that attended their well-directed efforts on behalf of such a deserving institution as the Royal Victoria Infirmary, Newcastle. During the afternoon and evening the main streets presented a very animated appearance, there being many visitors from the surrounding districts. 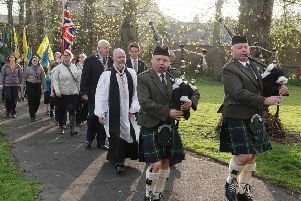 The programme was opened in the afternoon with a procession from the Market Place to the Carlisle Park, better known as the Castle Banks. This was headed by the band of the Royal Field Artillery from Newcastle, who attended by permission of Colonel J.A. Burrows, C.M.G., and officers. In the park a large crowd listened to a varied programme of music by the band. In the evening a meeting was held in the Market Place at which eloquent appeals were made for financial support for the Newcastle Infirmary. There was a very large crowd present. Interest in the meeting was enhanced by the presentation of war decorations — the Military Medal to Sergeant J.B. Dodds, N.F., and the Medaille Militaire to Sergeant John Thomson, N.F. — and also by a presentation on behalf of the local War Heroes’ Fund. The Mayor said the object of the gathering was twofold — to help the Royal Victoria Infirmary financially, to which the town owed a great debt, and to present medals to two Morpeth heroes. (Applause.) He hoped they would give the two heroes a real Morpethian welcome. The Lord Mayor of Newcastle pointed out that the sick poor of Northumberland and Durham, as well as those of Newcastle, were cared for at the Royal Victoria Infirmary, which had never done a more magnificent work that it was doing at present. The war had tested men and institutions, and the Royal Victoria Infirmary had stood the test like the house in the Old Book, which was founded on a rock. Then there were 32 beds for civilian patients. There were, however, 2,000 names on the waiting list, men and women rapping at the doors for operations. Last year 6,579 patients occupied beds, and 54,000 out-patients received treatment. Morpeth last year sent 29 to be treated in the wards, in addition to 32 out-patients. Money was needed. An extension was to be carried out, and for that 15 acres of land had been given by the Corporation and the Freemen. It was his pleasing duty to do something more than appeal to them. He had been asked to make presentations to two gallant soldiers from this town. He wanted to tell them something about these lads, Sergeant Dodds and Sergeant Thomson. Sergeant Dodds belonged to the Northumberland Fusiliers. He went to France in April 1915, and took part in the two battles of Ypres. He returned to England with a wound, and had not been out since. If he had to go out again let it be after those had gone who had never been out. Mr Renwick then said that the other hero was Sergeant Thomson. This man’s gallant services had been recognised by the French Government. He had been awarded the Medaille Militaire for distinguished service in the field. The total sum realised, including sale of flags and donations, amounted to £171 17s 9d. The secretary, Mr J.R. Heron, presented the annual report. Reference was made to the organiser, Mr Hunter having been taken for the Army, and the work of organisation has been relegated to a sub-committee. A long and heated discussion ensued. It transpired that Mr Hunter was attending conferences and meetings in various parts of the country, and it was contended that he was being paid by some other organisation. It was urged, therefore, that he ought to be called upon to support his own wife and household. The reception was carried by 17 votes to 10, and the Joint Executive, which is composed of representatives of the Morpeth and Wansbeck L.R.C.s and the Northumberland Miners’ Executive, are to meet to consider the question. It was unanimously agreed to approve the resolution adopted by the National Union of Railwaymen regarding the Triple Alliance and industrial compulsion. Mr Heron moved a resolution condemning the action of the Seamen and Firemen’s Union in preventing Mr Ramsay Macdonald and his colleagues from going to the Petrograd Conference. The Russian people, he contended, were anxious that Mr Macdonald and his colleagues should have gone. Mr Macdonald was not an advocate of a separate peace, and he did not see what cause they had for fear of passing such a resolution. Mr Kennedy (Blyth) seconded the resolution, and said as England was a free country they had a right to free speech. He did not think the Russians were laying themselves out for a separate peace and he considered it would have been to the advantage of the working classes if Mr Macdonald and his colleagues had been allowed to go to the conference to discuss matters. Mr A. Kinghorn (Barrington) supported the resolution. The Russian people had been asking that Mr Macdonald should be sent to speak to them. Mr Macdonald had declared that he was against a separate peace. Mr Davison (Blyth) strongly opposed the resolution, and declared that the decision of the Leeds Conference and the declarations of Mr Macdonald were by no means the expression of the opinion of organised labour in this country. He held that the seamen and firemen were quite justified in making it very clear that Mr Macdonald and his associates did not represent the working classes of this country on the very vital question at issue. On a vote being taken there voted for Mr Heron’s motion 17 and 9 against. Mr Cairns, referring to the Speaker’s Conference, said it was not a representative meeting of Labour. Referring to the women’s vote proposals, he said he was in favour of every man and every woman 21 years of age having a vote for municipal and parliamentary purposes. What he had said about the war was that he understood that it belonged to the men who were fighting. He believed that this country would have been taken from us if we had not fought. Referring to conscientious objectors, he said had a lot of friends who claimed to be conscientious objectors. He had never abused a man for being that, because there were some real conscientious objectors, and there were some who were not real. The Northumberland Volunteers are to have a Bank Holiday camp from the Saturday till the following Tuesday. Judging by the success of the Race Week camp at Whitley Bay great things are expected. The area covered will be a comprehensive one, taking in the full five battalions. So far, men are eagerly looking forward to the event, for the opportunity is one which gives a man a chance of taking a holiday that is a credit to himself as well as an advantage to his country. There is no room for the other kind of men today. The Whitley Bay week was of a bolder experimental character, and individuals and detachments were not bound to any period longer than that between one parade and another. They could come for a single parade, and many did. During the eight days the sum total of attendance at a parade was about 3,000, and about 250 men passed the efficiency test to qualify for the capitation grant, a highly satisfactory result. Two classes of men will be accommodated in the huts or under canvas, consisting of recruits who have not passed the efficiency test, and the efficients who have. The first object of the camp is to get recruits made efficient by passing the test, which is a four-fold one. In the first stage comes route marching, squad drill, and extended order drill; in the second, bayonet fighting; in the third bombing; and in the fourth musketry, the latter consisting of firing thirty rounds at ranges varying from 100 to 300 yards in deliberate and rapid firing. A course of training will be given to efficients to take them on by progressive stages to a higher standard. About 1,000 men of the Volunteer Force are through the efficiency stage, and the object of the August camp is to get something like another 1,000 men up to the standard. The co-operative of employers is needed to make the camp a success, and in their hands rests much of the responsibility for the future of the Volunteer movement. One is often asked how the Volunteer movement is progressing. In the 1st and 2nd Battalions the strength cannot yet be considered satisfactorily in view of the great population from which the battalions are drawn. The numbers ought to be doubled if men were not to act on the principle of “Let the other fellow do the work.” We believe it is only apathy, however, and that men would rise to the occasion if the circumstances demanded it. In the 3rd Battalion area the progress has been most gratifying, The owners, officials, and men of the collieries have responded splendidly, with the result that the 3rd, which has only been in process of formation for three months, now becomes the strongest battalion in the regiment. That is all due to whole-hearted co-operation, and it says much for the patriotism of those who are concerned in it. The 4th Battalion covers a very large area, and has not the centres of population that are to be found in some of the others. At Gosforth things are very disappointing. From a population of 15,000 better results were expected. Gosforth cannot afford to be idle these times when other parts of the country are recognising their responsibilities. The 5th Battalion, again, covers a widely scattered area, and has its principal centres of Berwick, Alnwick, Morpeth and Ashington. The old town of Berwick has been quite encouraging, as one would expect from a place of its military prestige, though there is room for improvement. Alnwick is distinctly disappointing, and the hitch, whatever it is, should be overcome. Morpeth is doing very well, and there was a good contingent at the Race Week camp, the men doing exceedingly well. Lieut. Duncan, the O.C., was in camp all the time, and Lieut. Shaw spent a good period there. Ashington has not yielded the recruits expected. It is a big centre of population, and has done well for the Army. It is up to it to do as well for the Volunteers. The Ashington Coal Company is taking a keen interest in the movement, and developments may be watched.